Higher education is moving into a new phase when it comes to the power of technology in the classroom. More sophisticated learning tools are being developed, and they promise to fundamentally change how instructors teach and students learn. Such advances are being met with a mix of resistance and acceptance. Some educators worry that new technologies may diminish their role in the education process will eventually replace them, or that digital learning tools are too costly, or not necessary. Some are concerned about the amount of work involved with incorporating technology into their courses. Despite such uneasiness, a growing number of educators are adopting the tools and using them in innovative ways to enhance student learning. We are at the forefront of this rapidly changing landscape. Our post-secondary educational products and services are used by millions of educators and students around the world: MyLab, Mastering, and Revel are the world’s leading digital homework, tutorial, assessment, and immersive products. Pearson Inclusive Access is being implemented at more than 450 U.S. colleges and universities to deliver electronic course materials to students on or before the first day of class, thus saving the students millions of dollars in materials costs. Pearson Career Success, currently used by more than 80,000 higher education students, features a technology platform that allows users to discover, develop, and demonstrate the personal and social capabilities they need for career readiness and success. Among other products, Learning Catalytics is an interactive student response tool that educators are using in classrooms and lecture halls to pose questions and poll students’ understanding real-time with graphical visualization. We are continuing to develop even more advanced learning tools, including technologies that can assess critical thinking skills and broaden tutorial capabilities. According to higher education experts, many educators are turning to technology to enhance the learning experience, deliver improved outcomes, and to manage increasing class sizes and varying learning styles. They are selecting course materials that are available in digital format, and they’re using interactive tools to check students’ progress and mastery on assignments when completing course assignments. Many educators are redesigning coursework to blend online activities with classroom experiences. Some are sending texts and emails to nudge students to keep up with assignments, while others are recording and streaming lectures for students to view outside the classroom at their convenience, on a variety of mobile devices. A number of educators are even setting up labs where students can use sophisticated technology to conduct research. For example, the college of education at the University of Illinois at Urbana-Champaign two years ago unveiled its Illinois Digital Ecologies and Learning Laboratory (IDEALL) where students can set up technology–enhanced learning environments and then use technology to study the impact on learning. The lab features state-of-the-art equipment, including 360-degree audio- and video-recording systems, ceiling-mounted cameras, and 55-inch touch-screen tabletops. University researchers say the entire lab operates as a data-collection device to track learners’ interactions with technology. 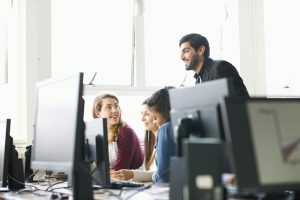 They use data analytics techniques to identify patterns and relationships among the learners’ movements, responses, discussions, and other actions to gain insight into their levels of engagement. H. Chad Lane, an associate professor of educational psychology, says the high-tech lab is making a “huge difference” for student researchers, and is an energizing, popular, and much-sought-after resource. Although students might be gravitating toward digital tools, many education technology experts say their use will not replace instructors. 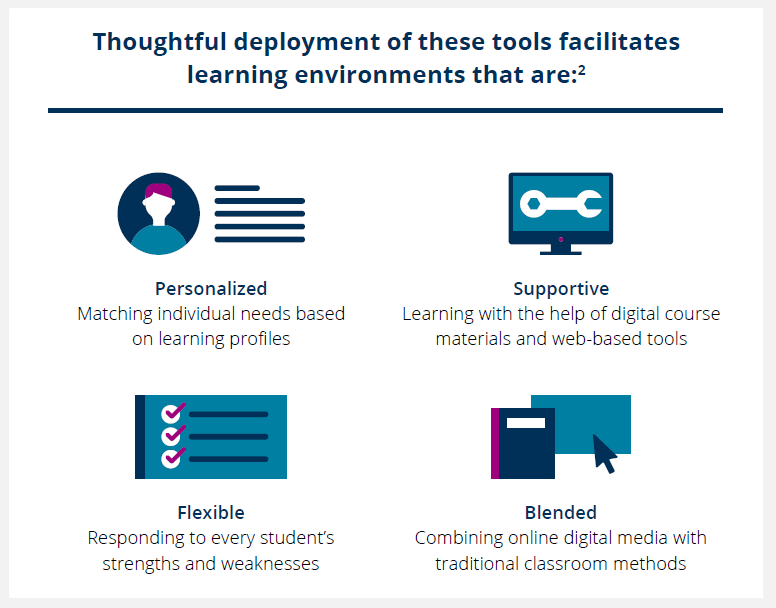 Digital learning, the experts say, makes educators better able to meet the students where they are technologically, better able to adapt lessons for varied learning styles, and better able to reach more students. Those benefits, the experts say, translate to stronger academic success, improved retention rates, and higher graduation rates. The proliferation of personal devices is also changing the landscape for professors. Out of the roughly 18.6 million students currently enrolled in U.S. colleges and universities, about 88 percent own laptops, 85 percent own smartphones, and 50 percent own tablets, according to figures compiled by Pearson. 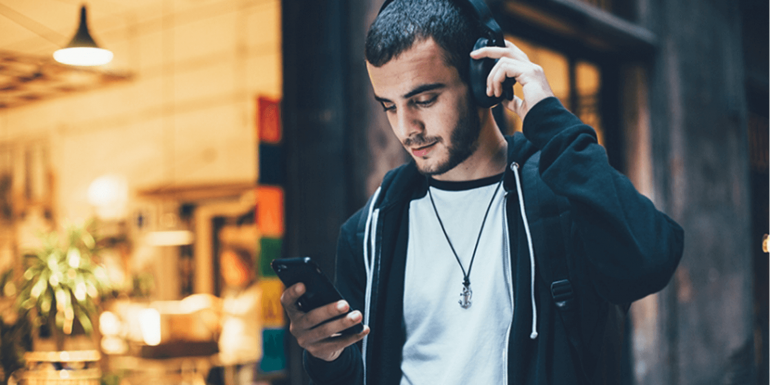 Indeed, 84 percent of college students responded that digital materials are important to resolving challenges facing higher education today, according to a survey sponsored by Pearson. The survey, Digital Appetite vs. What’s on the Table, was conducted in August 2016, and examines the role of digital materials in today’s college classrooms. Increasingly, colleges and universities are using technology to provide course materials more quickly, easily, and cheaply. Educators say that if students don’t have their materials from the first day of class, they’re already behind. 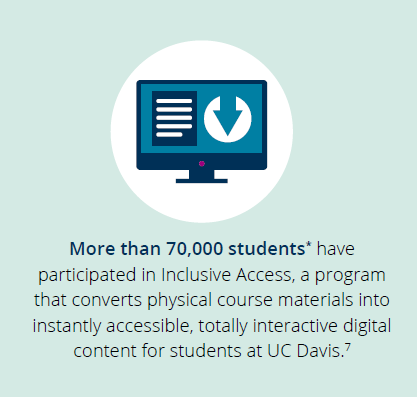 At the University of California at Davis, over the past three years, more than 70,000 students have had their course materials delivered digitally through the Pearson Inclusive Access model, saving students a total of $7million, compared with what they would have paid for print textbooks, according to Jason Lorgan, executive director of the UC Davis stores. Student surveys on the Davis campus show that more than 60 percent of the students believe the adaptive digital content is more effective for learning than print, says Lorgan. “Adaptive digital content is improving all the time, and we are excited that our faculty have this additional option to consider for their students,” he says. Indeed, students can access digital coursework on their own schedule, anytime, anywhere, on their personal device of choice. Digital products also offer a flexibility and malleability that print books cannot. Electronic materials can be easily updated by publishers, and they can be integrated with other technologies to become even more adaptable. Interactive learning solutions typically present topics in small chunks, along with a video, audio, or other teaching aid. Students can highlight and take notes, and they test their knowledge before moving on to the next topic. The interactive capability helps students grasp the concepts, accounts for their different learning styles, allows them to work at their own pace, and pushes them to be more engaged in their studies—all while helping to reduce the cost of learning materials by as much as 70 percent. The interactive capabilities also help the instructors by giving them a broader reach to connect with students, an opportunity to give feedback outside class, and the ability to adjust and optimize their instructional plans. Instructors can electronically observe what assignments have been completed, how long it takes students to do them, and how they score on the online quizzes. Educators can send notes to students, prompt them online, or modify a lecture, assignment, or coursework, if they see that students are not understanding a concept. In fall 2017, Robert Carlson, an instructor of English at Texas Southmost College, began using the Revel immersive platform in his composition course because he had grown frustrated with his students not preparing for class. Before, he would use class time to give reading quizzes. The grades were low, and the students apathetic. Now, students are motivated because they get credit for completing readings, and class time is used for higher-quality discussions. “I see the technology as supporting me because students know that they are accountable,” says Carlson.